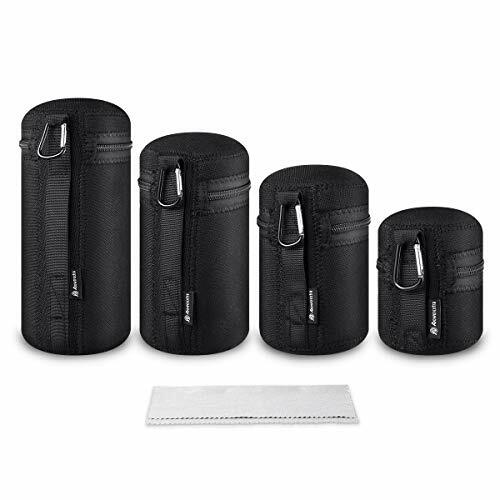 This 4-pack includes all 4 sizes of the Powerextra Neoprene Lens Pouches. The lens pouches featured with super soft interior lining, 5mm extra thick padded bottom, and water resistant neoprene exterior with clips. - Thick water-proof neoprene with thick soft plush protects lens against moisture, sand, dust, accidental bumps and scratches. - Strong drawstring and lock catch are designed for easily storing and carrying. 【4 PACK INCLUDE】Small, Medium, Large and Extra Large Neoprene Pouch Bags for DSLR Camera Lens + MagicFiber Microfiber Lens Cleaning Cloth. 【COMPATIBLE MODELS】Compatible with almost all camera lenses. Works for Canon, Sony, Nikon, Olympus, Fuji, Pentax, Panasonic, Leica, Sigma, Tamron, etc. 【PRACTICAL LENS CASE】With waterproof, dustproof, moistureproof and shock absorption function, protecting lens against bad weather, keeping your valuable camera equipment safe and dry. 【THICK WATERPROOF FABRIC】Thick soft neoprene protects lens, telephoto zoom from accidental bumps and scratches. 【SATISFACTION GUARANTEE 】Products come from our Powerextra is 1 year quality gyarantee, and 24 Hours friendly customer service!